Wall Street should reform its outdated compensation system that rewards bankers for taking big risks. 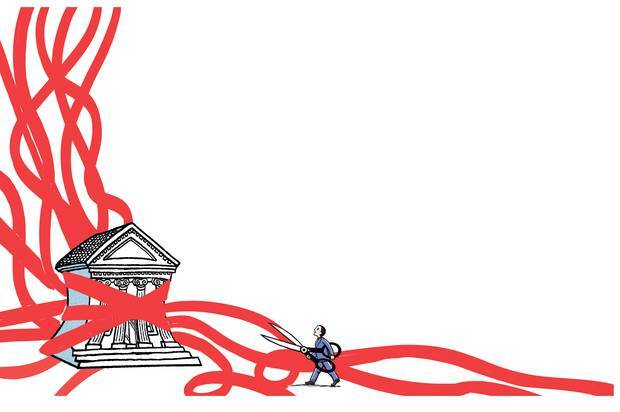 Regulatory relief for the country’s big banks may soon be on the way—and not a moment too soon. For seven years, the unintended consequences of the Wall Street Reform and Consumer Protection Act have clogged the gears of capitalism. Colloquially known as Dodd-Frank, the bill was designed to ensure that big banks would never again trigger a financial crisis. But the law’s 848 pages and the 22,000 or so additional pages of related rules and regulations have created a crisis of their own. The promise of Donald Trump and his economic advisors and a Republican Congress is that loosening the restrictions on Wall Street and other banks will unleash long-hibernating animal spirits and jolt the nation’s gross-domestic-product growth into a higher trajectory. In February, President Trump issued an executive order signaling his intention to dismantle Dodd-Frank. In the past month or so alone, the House of Representatives passed a bill gutting Dodd-Frank and sent it on to the Senate, and the Treasury Department issued a lengthy report calling for Dodd-Frank to be trashed. The most important piece in this puzzle, however, has gotten the least attention. On July 10, the president nominated Randal Quarles to the Federal Reserve Board of Governors and gave him the responsibility for regulating Wall Street and removing the shackles that Dodd-Frank and other postcrisis rules have placed on it. 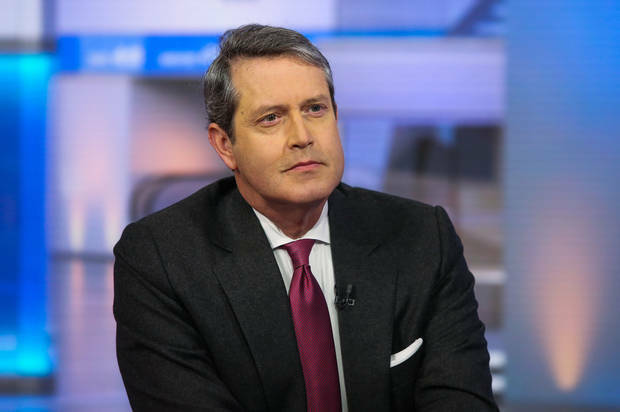 Quarles, 59, a onetime partner at the Carlyle Group who left at the end of 2013 to start his own private-equity firm, served as a Treasury official in both Bush administrations. Not surprisingly, he is known to favor a lighter regulatory touch than his predecessor, Daniel Tarullo, and will push for the elimination of many of the rules that Wall Street dislikes. In a March 2016 Wall Street Journal opinion column, he criticized the then-popular idea of breaking up the big banks, which he thought would damage the economy. TEAM TRUMP’S IDEA is that by encouraging banks to lend money to small and medium-size businesses—those that Dodd-Frank critics say have been more or less starved for capital in the past decade—hiring, wages, and investment will increase. GDP growth is highly correlated to bank lending and, so the theory goes, encouraging more lending should help the economy break out of its GDP rut. Easier said than done. According to the nonpartisan Conference Board, the consensus GDP estimates for the rest of 2017 and 2018 still are much closer to 2% than to 4%. A recent study from Stanford University’s Hoover Institution argued that 3% growth would be possible if the administration’s plans were adopted. (Not coincidentally, three of the study’s authors are considered possible successors to Fed Chair Janet Yellen.) At the very least, if the administration acts judiciously—eliminating the worst of Dodd-Frank while bolstering the best—the changes will strengthen the financial markets and possibly lessen the impact of the next crisis, when it comes. Deregulation has its dangers, including allowing Wall Street to take too much risk and to concoct products that export that risk to investors around the globe. Trump should be careful not to give the big banks carte blanche. They need and even want smart regulations, in the same way drivers know that seat-belt and drunk-driving laws make the roads safer for everyone. To ease up on regulatory speed limits without causing another economic calamity, Trump should strike a grand bargain with Wall Street. In exchange for the smarter regulation that the banking industry seeks, and seems on the verge of getting, he should insist that Wall Street adhere to several postcrisis rules, including those that require higher bank capital and reduced balance-sheet leverage and that require derivatives to be traded on exchanges where their prices can be determined more easily. And, as part of the grand bargain, Trump should also insist that Wall Street reform its outdated compensation system, which rewards bankers, traders, and executives for taking big risks with other people’s money, but fails to hold them accountable when things go wrong, as happened in 2008. Bankers, and the politicians who love their political donations, have been silent on the twisted incentives created by Wall Street’s longstanding pay practices. But a few responsible voices, including Warren Buffett, Bank of England Governor Mark Carney, and New York Fed President William Dudley, have pointed out the need to tweak incentives to change the culture on Wall Street and the behavior of the people who work there. In a March speech in London, Dudley reiterated his view that “bad incentives” played a key role in the financial crisis—and continue to be problematic. While getting Wall Street to change its pay practices won’t be easy, there is little question that it would be popular politically. Who could be against a system that better ties compensation on Wall Street to the behavior of the people who work there? Furthermore, there is a historical precedent that bankers and traders on Wall Street will recognize. Prior to 1970, the Wall Street partnership structure ensured that bankers had plenty of skin in the game—essentially their full net worth was on the line every day. Requiring that Wall Street’s top executives, bankers, and traders again have a significant portion of their wealth at risk would provide much-needed accountability and reinforce the soundness and safety of the financial system. It would also unleash the power of the U.S. economy. Since President Barack Obama signed Dodd-Frank into law, nearly everything Wall Street does, or tries to do, is subject to oversight. Regulators can scrutinize any loan they like and attend meetings of bank boards of directors. The cost of complying with Dodd-Frank and its related rules and regulations runs into the billions of dollars annually, and it has cost the banking industry more than $36 billion since 2010, according to American Action Forum, a conservative think tank. Smaller local banks, in particular, have been begging for relief from the costs of compliance. “Dodd-Frank has disproportionately burdened community banks, despite their having no role in the financial crisis,” Schwarzman wrote in the same piece. 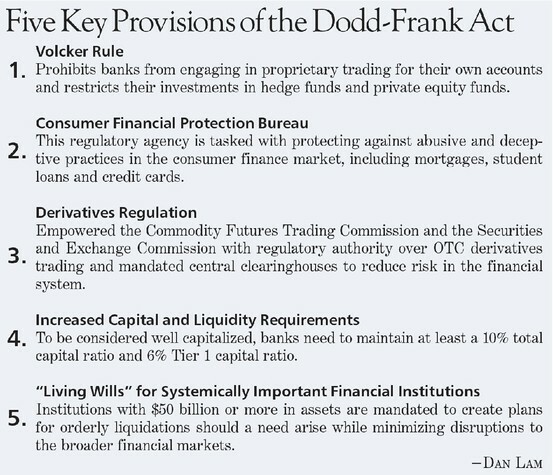 NOT EVERYTHING RELATED to Dodd-Frank has been a mistake, however. Big banks are required to have more capital and less leverage. 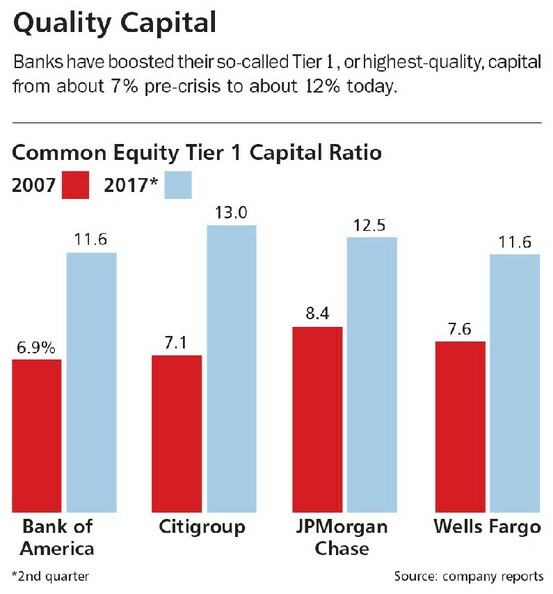 Under pressure from the Fed, for example, banks have boosted their so-called Tier 1, or highest-quality, capital from about 7% pre-crisis to about 12% today. What used to be an assets-to-shareholder-equity ratio of as high as 50 to 1 is now closer to 15 to 1, meaning that a bank’s assets would have to fall in value by about 7% before a bank’s capital would be wiped out, as opposed to falling 2%, as in 2008. This makes them, and the system, safer. Indeed, Steve Eisman, a portfolio manager at Neuberger Berman, says that for the first time since 1992, when he started his career analyzing the banking industry, he isn’t worried about the “safety and soundness” of the U.S. financial system. He has an eye for spotting banking crises—his prescience about the 2008 collapse earned him millions and a starring role in The Big Short, Michael Lewis’ best seller about the crash. Still, the pendulum is swinging. On June 8, the House passed the Financial Choice Act, designed to gut much of the post-financial-crisis legislation. Presumably referring to the stagnant economy, Rep. Jeb Hensarling, a Texas Republican and chairman of the House Financial Services Committee, said, “Every promise of Dodd-Frank has been broken.” His bill passed along party lines. Four days later, Mnuchin’s Treasury issued a 149-page report calling for many of the repeals found in the House bill, including a reduction in bank capital requirements and an easing of Volcker rule restrictions. Even if getting the House bill through the Senate won’t be possible without support from Democratic senators, there is much that the Trump administration can do on its own to loosen banking regulations and make it easier for Wall Street to get back to the business of providing capital to people who want it and are willing to pay a fair price for it. For starters, the administration could have the Securities and Exchange Commission roll back certain Dodd-Frank rules and pull regulators out of Wall Street firms. While some on Wall Street would like Trump to take a sledgehammer to Dodd-Frank, others expect the changes to be incremental. Eisman expects Quarles to make changes on the margins. In all of the talk of Wall Street reform, there has been almost no discussion of changing the industry’s compensation structure, which has been good at rewarding bad behavior and swing-for-the-fences bets with other people’s money, but poor at rewarding prudent risk-taking and accountability. There’s no mention of Wall Street’s problematic incentive system in the Hensarling bill, nor in the Mnuchin report. Few regulators have raised it as a concern, let alone a problem desperately in need of a fix. Addressing the compensation system has become something of a third rail on Wall Street: Everyone knows it’s a problem, but no one dares go near it. Indeed, on Thursday the SEC and several banking regulators backed off from such a push, which had been mandated by Dodd-Frank, in the interest of moving forward with other deregulation priorities. And yet it is indisputable that Wall Street’s compensation structure is broken, and has been since 1970, when Donaldson, Lufkin & Jenrette raised capital in the public markets. One Wall Street partnership after another tapped the public equity markets, substituting other people’s money for the partners’ money. In turn, what had been a partnership culture that rewarded prudent risk-taking on Wall Street has been replaced with a bonus culture, rewarding big revenue generators with multimillion-dollar bonuses. Lots of things were lost along the road from private partnerships to pubic companies, but foremost among them was any sense of accountability for individual bankers, traders, and executives for the consequences of their inevitable bad behavior. 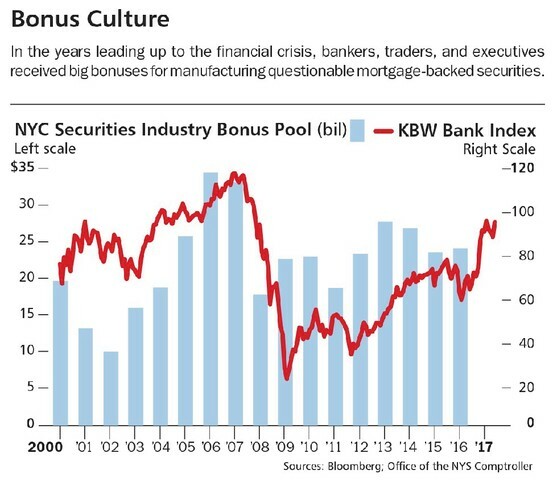 In the years leading up to the 2008 financial crisis, bankers, traders, and executives were rewarded with big bonuses for manufacturing questionable mortgage-backed securities. By the time they blew up, necessitating a government bailout of the banking system, the bonus checks had been cut, dispensed, and cashed. Not a single bonus was clawed back or repaid. In my 2009 book, House of Cards, about the collapse of Bear Stearns, a conversation I had with Jimmy Cayne, the longtime CEO of the firm, proves the point. When I asked him what it was like to lose a billion dollars of his net worth—after Bear’s stock collapsed—he didn’t respond the way I thought he would. “The only people [who] are going to suffer are my heirs, not me,” he said. “Because when you have a billion six and you lose a billion, you’re not exactly like crippled, right?” Maybe he would have thought differently about the risks Bear Stearns was accumulating if his full net worth was on the line, as it was before the firm went public in 1985. Nearly a decade after the second-worst financial crisis in U.S. history, bankers, traders, and executives are still rewarded for taking big risks with other people’s money. In exchange for the comprehensive changes sought by Wall Street executives, Trump should insist that the top 500 or so executives at every big bank—the ones who decide how to deploy capital, which business lines to be in, and who gets promoted and paid—have a significant portion of their net worth on the line every day, as was de rigueur in the days when Wall Street firms were partnerships and imprudent decisions could put an entire firm at risk almost overnight. There are many ways that lawyers could construct this obligation—giving creditors and shareholders a “contingent value right” tied to their collective net worth, for instance—but regardless of the particulars, the important thing is for Wall Street’s leaders to have skin in the game, just as they once did, to act as a brake on dangerous practices and ensure accountability when things go wrong. IT WON’T BE EASY to get Wall Street to go along. Why should the industry voluntarily change an incentive system that pays employees millions of dollars a year to take big risks with other people’s money? But that’s just the point. It’s time for Wall Street to do something that will benefit the whole system, and changing the rewards on Wall Street will do just that. WILLIAM D. COHAN, a special correspondent at Vanity Fair and a former investment banker, is the author of Why Wall Street Matters, Money and Power, House of Cards, and other best-selling books. Money last month poured into funds and securities that offer some protection against a sharp correction in the US stock market, the latest sign of cautious behaviour from both professional and retail investors in response to equities at record levels. Preparation for the risk of upset comes as market activity slows for the summer and in advance of possible central bank action in September, when policymakers may announce plans to remove crisis-era monetary policy measures. Nikolaos Panigirtzoglou, cross asset strategist for JPMorgan, said conversations with clients in recent weeks had been dominated by what may happen if the Federal Reserve and European Central Bank withdraw stimulus in the autumn. He said: “Investors have already started reducing their net exposure to risky markets via hedges in order to protect themselves against a repeat of the August 2015 correction” — a month of turmoil prompted by fears for the Chinese economy. Attempts to insure against market losses come as the S&P 500 index has risen more than 10 per cent so far in 2017, extending a rally for US stocks into an eighth year and pushing long-term valuation measures close to records. In the four weeks to July 28, retail investors pushed $445m into exchange traded funds tied to the Vix, an index designed to represent the volatility of day-to-day movements in the S&P 500. The value of the Vix, which in July hit its lowest intraday point since the 1990s, is expected to rise if markets become more volatile, and the high cost of Vix ETFs makes them speculative, short-term investment vehicles. “Monetary policy tightening from the FOMC and ECB are the most likely catalysts for an uncertainty shock,” said Michael Underhill, chief investment officer at Capital Innovations. However, Mr Underhill said central banks have a habit of “arriving late to parties,” so he was looking for buying opportunities in such market pullbacks. He has been taking profits on the high-flying technology sector and may consider rotating into sectors that have underperformed tech, such as energy and materials companies. Weekly fund flow reports suggest cash has continued to move into bond funds, which may reflect investors attempting to rebalance their portfolios in response to the rising value of stock holdings. Fixed income mutual funds had attracted $355bn in the first five months of this year, putting the sector on course to beat 2016’s full-year inflows of $375bn, according to Morningstar. Markets used by professional investors provide other indications of efforts to insure against instability. The ratio of option contracts that pay out when the Vix rises, versus those which pay out when it falls, is close to a record high, according to JPMorgan. The ratio between outstanding puts and calls for options on the level of the S&P index is less extreme. After months in which the day-to-day movements of stock markets have been unusually calm, Mr Panigirtzoglou said the option market behaviour may reflect greater demand for investors using hedging arrangements in anticipation of a spike in volatility, rather than typical market correction. Jaroslaw Kaczynski, the most powerful politician in Poland, is the architect of judicial reforms that have drawn massive criticism across Europe. As the Polish government chips away at checks and balances, is it possible the politician could drive the country out of the EU? The nucleus of Poland's political power lies not in the parliament in Warsaw, not in the presidential palace, but in a windowless, slightly strange looking building that most resembles a multistory car park. It's not quite part of Warsaw's city center, although downtown's many new glass and steel skyscrapers are still just in sight. Every day, an official car picks up Jaroslaw Kaczynski from his apartment in the Zoliborz neighborhood and brings him to this office block at 84-86 Nowogrodzka. The building houses a sushi restaurant, a copy shop and an insurance company -- and the headquarters of Kaczynski's ruling Law and Justice (PiS) party. Its chairman uses a separate entrance. In the mornings, a team of young staff members supplies him with books, newspapers and printouts. All in Polish, because Kaczynski only reads Polish sources. At midday, a procession of black limos starts arriving, delivering ministers -- and occasionally the president of the Polish National Bank -- to the Nowogrodzka office to pick up directives and seek advice. Despite holding no formal government office, Kaczynski is Warsaw's undisputed leader. Together with his late twin brother, Lech, he founded the PiS party in 2001 and twice led it to victory. In 2015, he hand-picked its presidential candidate Andrzej Duda, at the time an unknown member of the European Parliament, who went on to win the vote. He also personally selected current Prime Minister Beata Szydlo. Both politicians are widely seen as Kaczynski's willing stooges. From a backroom in the Nowogrodzka office, he has turned Poland into a problem case for the EU. Poland, of all places. Under the liberal leadership of former prime minister Donald Tusk, it had long been viewed as the paragon among the Eastern European accession countries. But Kaczynski, who thinks in nationalist categories, clearly sees the union as a source of ready cash rather than a community of solidarity, to which his own country must also contribute. Under his leadership, this once deeply pro-European country might now be moving toward an exit. The ruling PiS party is already doggedly distancing Poland from Europe's central values. It has restricted the power of the country's highest constitutional court and filled top positions in public radio and television as well as major state-owned companies and the intelligence services with loyalists. In the past week, it turned its attention to reforming the independent Polish judiciary with the aim of giving parliament, in which the Law and Justice has a majority, and the president, chosen by the Law and Justice party, the power to appoint judges -- even in the Supreme Court -- who were previously nominated by the independent National Judiciary Council. Thursday saw the lower house of parliament vote through the reform, which now has to be approved by the upper house, the Senate, in a vote that is expected imminently, and signed by the president. To the surprise of many, Duda actually proposed a compromise reform, even though so far Duda has always acquiesced to his patron's will -- hence his disparaging nickname, "the notary." As Poland, the biggest and most important of the EU's Eastern European members, sets about dismantling the separation of powers, Brussels and Berlin are protesting loudly. The European Commission has referred to "a systemic threat to the rule of law" and indicated Poland could be stripped of its voting rights. But its leverage is limited. The Commission's probe into the "threats to the rule of law," launched last year, has stalled. Revoking Poland's voting rights would require a unanimous decision among all other EU member countries, and Hungary, whose prime minister Viktor Orbán is also no friend of liberal democracy, has declared he would never agree to such a move. The EU has no other sanctions to impose. But political resistance is also growing inside Poland. In recent days, tens of thousands of people have taken the streets to protest against what the opposition has called "an assault on democracy." But the PiS party doesn't need to worry too much about the demonstrations, which are restricted to the major cities. The party still enjoys a clear lead in national polls. The Polish economy is growing steadily -- by over 4 percent in the first quarter of 2017 alone. And tax revenues have also risen since the party came to power. Judicial reform is only one aspect of Kaczynski's plans to overhaul Poland. He has long entertained ideas of a "Fourth Republic," a strict but caring state replacing the "Third Republic," as post-communist Poland is often called. Parliamentarians with the liberal opposition fear that the government will continue eroding Polish democracy and that a compliant judiciary could start to challenge unwelcome election results. There are indications that the PiS party is planning to revamp electoral regulations so that it is guaranteed victory for years to come. Urban constituencies, where the party tends to perform poorly, could be redrawn to include more rural areas, thereby redistributing its majorities. The government's next target could be Poland's private media companies. A favorite buzzword of the Law and Justice party is "renationalization," which in this case would exclude by law international publishing companies from the Polish market. Kaczynski is a stocky man with a round head. He often looks disgruntled and rarely has any kind of emotional outburst. This week, however, he became unusually angry. During a parliamentary debate on the judicial reforms, a liberal member of parliament raised the specter of Jaroslaw Kaczynski's late brother Lech, who served as president from 2005 to 2010, and was killed in a plane crash close to the Russian city of Smolensk seven years ago. Jaroslaw Kaczynski stormed over to the podium. "Don't wipe your treacherous mugs with the name of my late brother," he bellowed. "You destroyed him, you murdered him!" The incident illustrates the party chairman's obsession with conspiracy theories. Like many in the party, he is convinced that his brother was deliberately killed in an assassination masterminded by Russia and approved by the liberal Polish government in power at the time. There was a time when Lech and Jaroslav were Europe's political curiosity nonpareil. They were outsiders, frequently mocked, not least for their appearance. But they had a talent for demagoguery, which propelled them both to power. From 2005 to 2007 they both held office, as president and prime minister respectively. Jaroslav continued to pursue their political agenda after the death of his brother in the Smolensk plane crash. But what is driving him? Two weeks ago, Kaczynski was the keynote speaker at a Law and Justice party congress in Przysucha, some 40 kilometers from Warsaw. "Poland is united," he said from behind the lectern in a drab auditorium. "We are here to ensure that everyone in Poland has the same opportunities, regardless of whether they live in the cities or in the country." Kaczynski is not a fiery speaker. He's not a champion of the people. He tends to enumerate ministerial achievements, which sounds dull, but only to the uninitiated. PiS party politicians listen closely, because this is when they get to find out who has earned brownie points. The list of acknowledgments tells them who is currently in favor with the "prezes," Polish for president. Issues and appointments are not debated within the party. Its agenda is drawn up by Kaczynski, as is the electoral list. Ideologically, he stands for what is essentially a left-wing vision of a generous state, dished up with what liberal politician Leszek Balcerowicz once called "nationalist-Catholic gravy." Kaczynski makes himself out to be the defender of the interests of the common people, defending them from the supposedly "pathological" consequences of the economic liberalism rampant since the fall of the Iron Curtain. From the very beginning of his political career, he has maintained that it was former communists and dissidents and not the general public who benefited from this economic upswing. According Kaczynski's narrative, they cherrypicked jobs and businesses from Poland's bankrupt estate and ushered in an era of dog-eats-dog capitalism. Average Poles were hung out to dry. Kaczynski wants to see the "networks" that emerged at this time tackled, and the most egregious examples of the cold new economic order crushed. The current PiS party slogan sounds less combative than previous ones: "dobra zmiana" means "positive change." The underlying message is that the party intends to make Poland more humane. In contrast, the liberal opposition, which had been in power until 2015, has little to offer these days. The bedrock of its political platform has always been the EU. Its vision is basically that so long as Poland is a reliable European partner, aid from Brussels will ensure prosperity for all. The trouble is that few people believe in this vision in the remote east of the country, in villages and small towns. The Law and Justice party appeals to people who are frustrated by the slow pace of economic progress. Its core voters are not the poor, but the middle classes. Families fed up with dilapidated schools and kindergartens, as well as small businesspeople and shop owners who feel threatened by international retail chains. These are the sorts of voters who want the PiS to guarantee a welfare benefit of 500 zlotys for a second child and reduce the retirement age from 67 to 65 for men and to 60 for women. Most of them attach little importance to constitutionally spurious moves such as the judicial reform. The judiciary they know from the post-'89 years was inefficient and corrupt anyway. It all goes to show that one reason why Kaczynski is such a successful politician is because he understands how to harness a mood and bring it to a head. He's seen as a modest man willing to sacrifice his own interests for the greater good of the country -- in direct contrast to Hungarian Prime Minister Viktor Orbán, who has a soft spot for oligarchy glamor. But where exactly does Kaczynski stand on democracy? "(He) loves Poland and believes in God and the state," says Michal Kaminski, who used to represent the Law and Justice party in the European Parliament and is now a conservative lawmaker in Poland's lower house. He says that Kaczynski is deeply convinced that he knows what is best for Poland and the Polish people. On principle, he is not opposed to democracy, but nor does he want his agenda to be impeded by pesky checks and balances such as a constitutional court. "Internally, the PiS party is looking increasingly more like a sect than a political party," says Kaminski. The case of Elzbieta Jakubiak lends weight to this theory. She used to work for Lech Kaczynski. After his death, she was ejected by the party by Jaroslav but has long since reconciled with him again. "He had to choice, he had to let us go in order to keep the party together," she said. Many in the party, it seems, are willing to see its chairman's every move as a brilliant maneuver, even when it entails their own exclusion. Operating out of his backroom office on Nowogrodzka, Poland's unofficial leader appears to be in an unassailable position. Whenever anything goes wrong, he can simply pass the buck. The death of his brother in a plane crash consolidated his standing. As the surviving twin, Jaroslaw Kaczynski has become part of the national mythology which is such as pillar of the Polish right-wing's identity: The Poles are heroic but forever victimized by Russia and Germany. It's an identity that also defines Kaczynski's foreign policy. "He doesn't understand the principle of the EU," says one former member of the Law and Justice party. As far as he is concerned, the EU is simply an ongoing competition between the member states. That's why he doesn't see the European Union as a project securing peace and prosperity. In his eyes, it is first and foremost an instrument of German power. Polls show that a large majority of Poles still support EU membership. But many diplomats fear that this support is crumbling. "When you talk to Law and Justice party politicians, it's obvious they think that the EU's best days are behind it and you shouldn't expect much from it anymore," says Marek Prawda, the Polish head of the European Commission representation in Warsaw. Resentment of Brussels is growing, he believes. PiS politicians such as Foreign Minister Witold Waszczykowski are constantly maintaining that Western European nations take the lion's share of Brussels' funds. He points to the German companies constructing roads and train stations in Poland, overlooking the fact they help create jobs, improve infrastructure and pay taxes in the country. Pressure from Brussels is unlikely to make the Law and Justice party cave in. If the EU ends up punishing Poland, relations will become even more strained. The government might one day question why Poland is in the EU in the first place. As one diplomat put it: "As Britain has shown, you can stumble your way into an EU exit." In this opinion piece, Payal Sheth, a global marketing manager at the Boston Consulting Group, explains how an ancient meditation technique helped change the way she thinks and engages with people. Yes, you read that right. Silent meditation. One might ask: Isn’t it obvious that you are almost always silent when you meditate? Yes, but what I mean by silent meditation is the technique referred to as Vipassana (which means to see things the way they are), one of India’s most ancient meditation techniques. I learned it over a 10-day course at Igatpuri in Western India, among the world’s largest meditation centers and the main center of Vipassana’s rapidly growing global community of practitioners. Participants in the course stay silent for 10 days. They do not utter a word (unless there is an emergency); make no gestures or facial expressions; and they commit to spending 10 to 12 hours a day meditating between 5 a.m. and 8 p.m. (with a few breaks in between). Imagine a day without your phone or an internet connection; a day when you don’t communicate with another person or say a single word. A day without anyone you know around you. Now multiply that by 10. That is a Vipassana meditation course. It is by far the toughest thing I have done in my life. I believe it is one of my most significant achievements. The effects of Vipassana are life-long, in my opinion. You do not see a change in your personality on the 11th day when you walk out of the center. But over the months and years that follow, the change can be dramatic, depending on your practice. You begin to notice an internal shift, a shift only you can feel at first, and then at some point the world begins to take notice, as more and more scientific evidence now reveals. The advent of MRIs and other brain-scanning techniques have allowed neuroscientists to peer directly into meditators’ brains to see the impact. For example, neuroscientists have learned that meditation strengthens the brain by reinforcing the connections between brain cells. A 2012 UCLA study showed that people who meditate exhibit higher levels of gyrification — the so-called folding of the cerebral cortex as a result of growth — which, in turn, may allow the brain to process information faster. Scientists suspect that gyrification is responsible for making the brain better at processing information, making decisions, forming memories and improving attention. Indeed, as much of the research shows, meditation causes the brain to undergo physical changes, many of which are beneficial. Other studies, for example, have shown that meditation is linked to cortical thickness, which can result in decreased sensitivity to pain. Neuroscientists have also used MRIs to compare the brains of meditators with non-meditators. The structural differences observed led the scientists to speculate that certain benefits, like improved cognitive, emotional and immune responses, can be tied to this growth and its positive effects on breathing and heart rate. The integrity of gray matter, which is a major player in the central nervous system, certainly appears to benefit. Meditation has been linked to more positive emotions, the retention of emotional stability and more mindful behavior (heightened focus during day-to-day living). In addition to these benefits, which health professionals at several universities continue to study, my experience is that meditation offers personal benefits. I enrolled in the Vipassana course just before I was to start working as head of marketing for the Boston Consulting Group (BCG) in India. And I can say with conviction that this technique has brought about meaningful change in the way I think, operate and engage with people. Here are some lessons I have learned, which continue to help me succeed at work. The fundamental premise of Vipassana meditation is acceptance. It teaches us to see and accept things as they are, instead of how we want them to be. This means that no matter how magical or miserable a situation may seem, we accept it as it is. We confront it in all honesty. We don’t cling to it, hoping things will never change, nor do we long for a rushed demise. Unlike other forms of meditation that help identify and stop certain thought patterns, or calm the mind using chants and visuals, Vipassana trains practitioners to focus the mind on observing the most subtle physical sensations. It is believed that these sensations are the root cause and the trigger of our thoughts and emotional reactions. By recognizing these sensations at their conception, instead of letting them develop and take us over, we can change our thought patterns to minimize agony and lead a more joyful life. Applying this principle in my work has made life so much more peaceful. I was often in a race to improve work situations or manage people’s egos. Sometimes I would get bogged down by difficult relationships with colleagues. Acknowledging and accepting that nothing lasts forever makes me view life in a different way. I no longer stay grouchy for days. I try to complain less and constantly remind myself of the impermanence of situations. By learning to step back and observe, you learn the art of responding rather than reacting. I had suffered from being reactive all through my life. As someone with a type-A personality, I gave a lot of importance to instant reaction. But that meant not giving myself time to think, reflect, introspect, and then act. I learned the process referred to as “response” only after meditating for more than 100 hours during the course. I remember during my pre-Vipassana days that I would immediately lose my temper if someone in my team did not meet a deadline or something did not go as planned. While sitting cross-legged on the floor in Vipassana for three consecutive hours, I now think about how quick I was to draw conclusions without giving someone an opportunity to explain. Reflecting on some of these traits has made me, I hope, a better people manager and a more rational individual. I once read that one of the key strengths of a successful leader is the ability to be decisive and see things clearly, even when one’s judgment is clouded by multiple concerns. In today’s fast-paced environment, it is essential to make decisions quickly. At BCG, whether you are a newly hired communications manager or an experienced marketing director, you have the creative freedom to introduce new ideas and implement innovations. To apply this creativity, one needs the ability to think clearly, strategize, and execute effectively. Vipassana meditation made me more observant and sharp and has enabled me to see things as they are. Over the years, I have seen a tremendous improvement in the way I make decisions and the clarity with which my mind can think. “Silence can be so powerful,” is something I had only heard. “Less is more,” is something I had only read. Ten days of not speaking a word was unimaginable for an immensely talkative person like me. That’s exactly what made the challenge of maintaining silence more attractive. I was determined to complete this course because I thought it was practically impossible to do so. It is during the silent meditation hours that it dawned on me that effective communication isn’t about the number of words we speak. Instead, it is about the way we articulate our thoughts. As a global marketing professional, I have always needed to be an effective communicator. This skill is especially critical in a leading consulting firm, where I have to communicate with colleagues whom I consider to be among the world’s most intelligent minds and be able to forge strong relationships with people across many cultures and languages. I consider this skill to be my core strength, and meditation has helped me sharpen it. Vipassana meditation, for me, was both an eye-opener and a rude shock. I experienced the most minimalistic form of lifestyle I could have ever imagined for myself, with no soft bed to sleep on; no air conditioning during the scorching summer heat; a room with spiders and webs; a very simple diet comprising fruits and vegetables; and no form of alcohol, artificial sugars, or any such addictions. Vipassana keeps me grounded even when I travel first class to some of the most exotic destinations in the world. It reminds me to count my blessings while dining at Michelin star restaurants or spending a week at the most luxurious hotels around the globe. It is a constant reflection of how nothing in this world is permanent, or anything to get hung up on. It’s just causes and conditions doing what they do, manifesting through the body. Going into Vipassana, I had strong opinions about relationships, morality, routine and personal choices. Walking away on day 11, I felt detached from so many of the preconceptions upon which I had built my identity. But it didn’t feel like a loss. Rather, it felt like a new beginning. For anyone who wants to start taking the first steps along the journey that I have been on, I have a few suggestions. Vipassana can seem intimidating at first and therefore my suggestion is to start small. Devoting one minute a day, every day for a week, could be a good way to begin and you can then gradually progress as you gain more experience. Meditators generally begin their practice by focusing their attention on their breath. I remember the first time I sat to meditate, all my mind did was wander and think of every possible thing in the world, except my breath. That, in fact, is very normal. The basic idea is simple. Every time your mind begins to shift its focus away from your breath and you get lost in thought, you simply — and gently — bring your attention back to your breath. And then you repeat this again and again until your meditation timer rings. All you need to start meditating is a mat to sit on and a timer and you are good to go. Why wait for the right time? Try it now. Though Sears surged on news that it would sell Kenmore appliances on Amazon, its stock could still tumble. Sears donned an Amazon halo Thursday when it announced that it will sell Kenmore products through Amazon.com including ones controlled by Alexa, Amazon’s voice-controlled assistant. 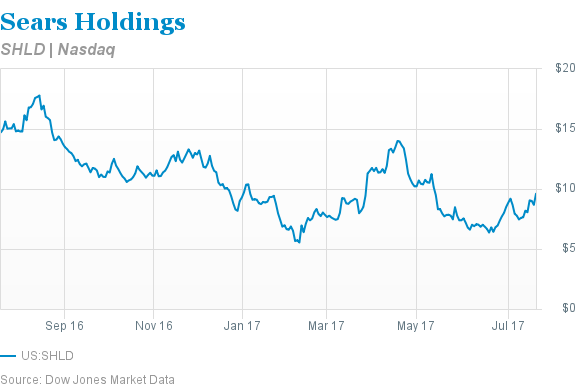 Shares of Sears SHLD in Your Value Your Change Short position (ticker: SHLD) jumped over 10% to nearly $9.60. That looks like an overreaction, according to Susquehanna Financial Group analyst and Sears bear Bill Dreher. He sees shares headed to $4 after the excitement wanes. Dreher cites three reasons: First, a comparison of Amazon (AMZN) and Sears.com suggests Sears is listing relatively few of its Kenmore products for sale on Amazon. Second, there are “horrible customer reviews and write ups of Kenmore products and service” on Amazon, writes Dreher. Third, Thursday’s jump might have been amplified by the fact that more than half of Sears shares available for trading had been sold short. On point two, Dreher might overstate the case, at least for now. A quick search for Kenmore products on Amazon shows that some are rated poorly, others are rated well, and most, so far, are scarcely rated. ConsumerSearch.com, which amalgamates reviews from third-party sources, recently had kind things to say about a Kenmore washing machine, vacuum cleaner, portable dishwasher and window-mounted air conditioner. Some of the brand’s products are reportedly made by companies it would seem to compete against, like WhirlpoolWHR in Your Value Your Change Short position (WHR) and LG Electronics (066570.Korea). Positive customer perception is important for Sears if it hopes to one day sell the Kenmore brand, the way it sold Craftsman tools this year to Stanley Black & Decker (SWK). Dreher writes that Sears, which hasn’t turned a profit since 2010, will need about $1.2 billion more in liquidity from outside sources this year and $1.4 billion next year to remain a going concern. He views the Amazon announcement as an admission that online investments for Sears aren’t working, and a sign the company is preparing the brand for sale. If Sears is indeed eyeing a future Kenmore sale, more positive reviews on Amazon would surely help. Then again, those reviews could be a double-edged sword. In the near term, they’re excellent for business; one academic study, slated for publication in the Journal of Financial Economics, finds that among companies that sell on Amazon, glowing reviews are linked with handsome subsequent stock returns. But longer term, Amazon “has conspired with about a billion consumers and technology to destroy brands,” as New York University Professor Scott Galloway put it in a recent lecture. In his view, brands serve as a shorthand for product quality, and companies invest richly to build the perception of their brands in order to boost pricing power and profits. But Amazon’s review system is a potentially better shorthand for quality, which has allowed the company to “start sucking the margin away from brands,” according to Galloway. 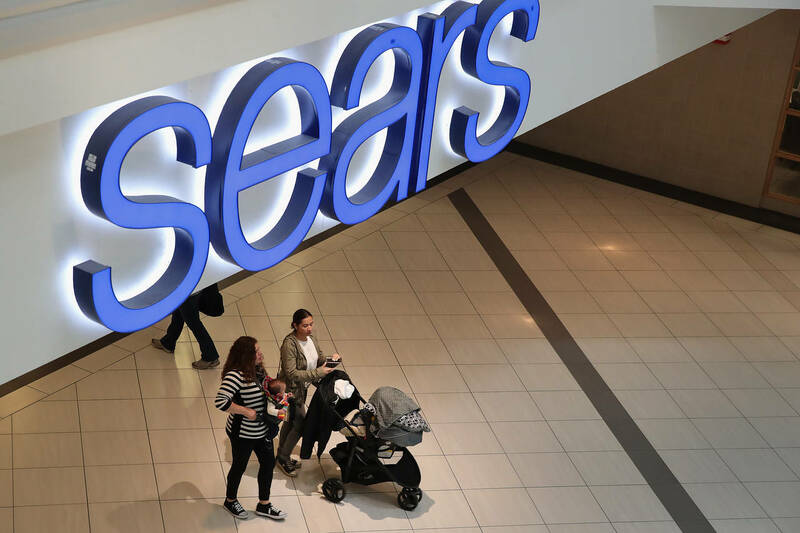 Good news for shoppers, perhaps—but worrisome for the long-term fate of Sears.